I've written about the role of brand style guides and what sort of information goes into them before, but in this article I want to focus on the benefits of having one in your own business, especially if you're not a designer yourself. My business involves a lot of emailing back and forth, filling out speaker applications, responding to client or interviewer questions, tweeting, posting on Facebook, responding to messages, designing presentations, making blog graphics, etc.—and that's all on top of my regular work of designing logos and brand for my clients. I'm guessing your business requires you to do many of those things as well. The greatest time-saving trick of all time that I’ve discovered is having everything written down and accessible wherever I go. Your short biography (multiple versions for different channels). Your services or products links and short descriptions. Answers to most common email questions (canned responses). “Client from Hell” red flags. The steps for longer and more complicated processes that you tend to forget. Direct links to your profile photo, logo, and social media graphics online. HEX codes for all the colors you use for your brand. You can store this information to cloud services such as Google Drive, Evernote, Dropbox, or OneNote. You can also use a text expander application to quickly insert common phrases, links, HTML codes, etc. into your writing without having to look it up on the cloud. I personally use these methods (my tools of choice are Google Drive and AutoHotkey), and I can't tell you how much time I've saved with it. If you need more motivation, listen to the Seanwes podcast episode 193: Automating When You Can’t Afford to Hire Yet. This leads me to the brand style guide. Brand style guide is a document containing your brand elements and assets, so you can review and share them with your team. If you work alone, this document will save you a lot of trouble because you'll have just one place you need to look in order to get all the information you need when designing marketing materials. If you work with a team, they'll prove exponentially more useful as they cut down misunderstandings and waste of time. Here's how a brand style guide can help you in your business. You can't waste time when you're running a business, because there's never enough to do everything you need to do. Every minute saved on chores is a minute you can spend doing something more impactful, or just chilling out on the beach, or watching funny cat videos. Style guides enable you to quickly access things such as your color codes and font names, and even your tagline, mission statement, and unique value proposition so you can just copy and paste them when you're customizing new apps or filling applications. Do you think I know the code of that exact shade of red off the top of my head? No, I don't. I could memorize it for sure, but I don't see the point. I look it up in my brand style guide. I've also started using the text expander app so that when I type brandred, it automatically changes to #C51F43. Neat, huh? Deciding on how to format the text and what colors to use is a breeze, because I don't ever have to think about it—I've done the thinking once, and now I just run with it. If you're at the point where you have contractors, employees, or strategic partnerships with other folks in your industry, having clear rules on how your brand should be represented is going to prevent people from butchering your visuals. There will be fewer misunderstandings with designers, developers, online marketers, social media managers, virtual assistants, and other people you hire to represent your brand. Your brand style guide can also serve as a filter for professionals whose style may not be suitable for your brand. If you have a clear vision of what you want your brand to be, you need to choose designers and other pros who are on board with your vision. Hiring a person who can't adapt to these guidelines is an exercise in futility. Supply your brand style guide immediately when you're evaluating potential hires and ask for examples of their work in a similar style, so you know they're able to pull it off. If you have branding guidelines and you supply them to your service provider, they'll know what's expected of them upfront, which means their very first proposal will be much closer to what you wanted than if they hadn't had this guide available. The more information you give to your contractors or employees in advance, the better job they'll do, and the less you'll need to pay for revisions. To make the most out of your brand style guide, keep it online: either on a cloud storage service with private or public sharing, or as a page on your website that you can access from anywhere. Bookmark the direct link to your brand style guide (and create a custom short URL using bit.ly) so you can easily copy-paste it in emails to your team members and partners. If your business has a logo, keep the logo and the brand style guide (and any additional graphics like icons, textures, etc.) in the same folder so you can share it all at once. 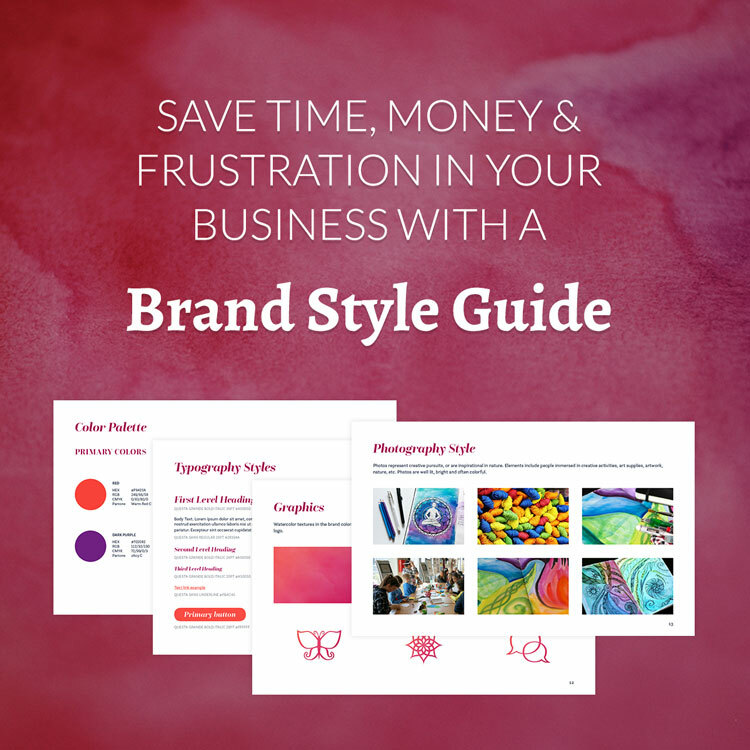 Learn how having a brand style guide can save you time, money & frustration in your business. Hopefully these benefits have convinced you to create your own brand style guide. Whether you want to do it yourself, or hire a designer to do it for you, I have resources to help with that. If you’re in the startup phase and aren’t able to invest in a professional brand, I get it. 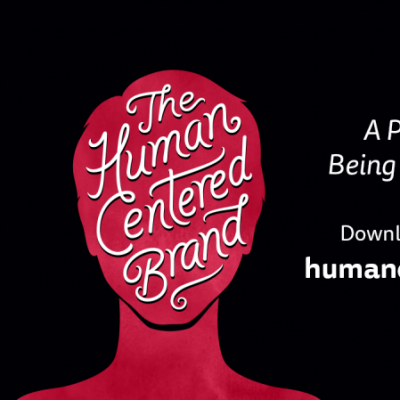 I recommend that you get started with my book The Human Centered Brand. 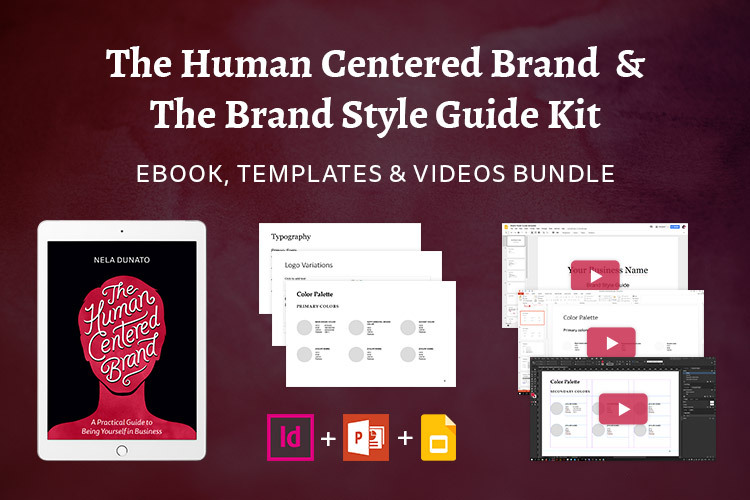 The Book + Brand Style Guide Bundle offers fill-in-the-blank templates you can use to create professional-looking branding guidelines for your own business. Prefer to let someone else do this? I get it, you're too busy to do this on your own. If you want your business to look its best and need professional help, I’d love to hear from you. Check out my logo & brand design services and contact me, so we can chat about your project and see if my approach is what your business needs right now.